Keeping your customers satisfied means offering quality products and fast delivery times. Often both these factors can make a huge difference when it comes to the success of a product. 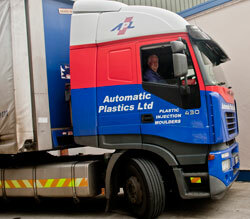 While APL offers the best injection moulded products in the industry, we also understand the value of logistics. APL runs 24/7 or 24/5 and we will tailor our work practices to meet your needs. In business, flexibility is everything, so we’ve put a lot of work into making our logistics solutions as efficient, dynamic and adaptable as possible. Based in County Wicklow, we are close to Rosslare ferry port for deliveries to destinations in the UK and the continent. In addition, we have contacts with many logistics providers in the UK, including access to a storage facility where we can keep a supply of products for rapid delivery when needed. Talk to us about your needs, requirement and timescales and we’ll do everything we can to tailor our operations to meet your needs.